Purposeful, stylish and clearly defined: Adam Bruce falls in love with Deborah McAndrew’s adaptation of Anne Brontë 1848 novel. The Tenant of Wildfell Hall, York Theatre Royal. Photo: Richard Davenport. The work of the Brontë sisters has a timeless, enduring appeal to readers, audiences and adapters alike. In recent years, we’ve seen a significant spattering of adaptations of their works, both theatrical and televised. They show a consistent desire to support characters written well ahead of their time, and to give new life to texts that’s battled against being pushed under the carpet for well over a century. Here, Anne Brontë’s lesser-known novel The Tenant of Wildfell Hall has been brought back to the cultural fore in a new adaptation by Deborah McAndrew at York Theatre Royal. The beautiful, haunting and desolate Yorkshire Moors take pride of place as the setting for Wildfell Hall. Young farmer Gilbert Markham (Michael Peavoy) meets the beautiful Helen Graham (Phoebe Pryce) on a hunting trip, and immediately falls in love with her and her undisclosed reasons for taking up residence in the lonely hall. The harder Gilbert tries to uncover her motivation for being on the Moors, the further he falls in love with her and the secrets shrouding her past. The Brontë writing style is characterised by long, atmospheric establishing passages and descriptive character portraits as well as representations of physical action. McAndrew has economically condensed their unflinching narrative voice into a well-paced, stand-alone adaptation that engages its new, live audience. She discards long exposition in favour of concise and steady character progression, giving the cast of this co-production between the Theatre Royal and Bolton’s Octagon Theatre a clear, developing landscape to thrive in. Elizabeth Newman’s clear direction is evident throughout. It’s entirely apparent that the rehearsals have been nothing short of both positive and nurturing; Newman has carefully drawn out some lovely portrayals from the whole company, the majority of which play two completely different characters. There’s something eerie about the choice of doubling that works beautifully in the production’s favour. It could be argued that it’s a clear nod to the ominous presence of inner demons and ghostly memories; we see stage images that are not only striking, but hauntingly reminiscent of the Brontë sisters’ own battles with their difficult past. There’s a sense that this adaptation also plays with where the spectator’s loyalties and main interests should lie; Newman has crafted an ensemble that is so invested in achieving utter narrative clarity that it’s easy to completely indulge in the situations we see, and their inherent consequences and obstacles for the characters. Amanda Stoodley’s simple yet stunning set and costume designs perfectly accommodate the adaptation’s narrative and its excellently drawn characters. Alongside Stoodley’s concept, Johanna Town’s lighting design firmly buffets and streamlines the action of the narrative with warm, twilit washes, enhancing the dark undertones that contrast with its chinks of light. Everything in this adaptation is purposeful, stylish and clearly defined, helping to enhance the production’s smart and economic feel. It feels both refreshing and atmospheric, providing both narrative clarity and enabling this neglected Brontë novel to draw its audience into a rich stream of cultural ideologies that have long since served as a reminder of how our society has developed. It’s raw and imbued with a true sense of vitality; a simply unmissable adaptation. 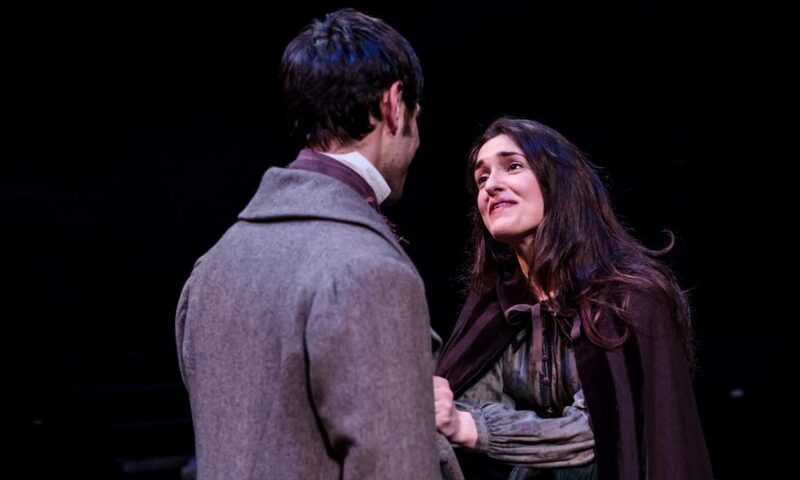 The Tenant of Wildfell Hall is at York Theatre Royal until May 6th. For more details, click here.